A Roadmap for Couple Therapy offers a comprehensive, flexible, and user-friendly template for conducting couple therapy. Grounded in an in-depth review of the clinical and research literature, and drawing on the author s 40-plus years of experience, it describes the three main approaches to conceptualizing couple distress and treatment systemic, psychodynamic, and behavioral and shows how they can be integrated into a model that draws on the best of each. Therapists will find A Roadmap for Couple Therapy an invaluable resource as they help distressed couples repair and revitalize their relationships. "This is one of the best books ever written about couple therapy. Presenting the most comprehensive and thorough compendium of couple therapy interventions ever assembled, Nielsen integrates the many strands of couple therapy into an invaluable coherent framework. Anchored in the author’s deep and encyclopedic knowledge of couple therapy and of individual approaches such as psychoanalytic psychotherapy, this is a marvelous resource for both the beginning couple therapist and the experienced practitioner." —Jay Lebow, PhD, Editor, Family Process; Clinical Professor, The Family Institute at Northwestern University; author of Couple and Family Therapy: An Integrative Map of the Territory. 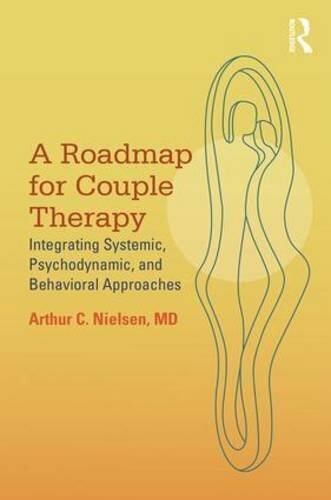 "Art Nielsen has written a great book on couples' therapy that is also highly integrative. It's delightful to read. Based on a wealth of clinical experience and maturity, with excellent scholarship behind it, this book is an important organization of the complexity of and the challenges in doing couples' therapy. It has many helpful examples. The book is also the finest presentation of a modern psychoanalytic perspective on couples' issues and how to help couples with the vulnerabilities each of us inevitably brings to trying to manage having a stable and satisfying close relationship." —John Gottman, PhD, Professor Emeritus in Psychology, University of Washington; author of The Seven Principles for Making Marriage Work. "A Roadmap for Couple Therapy is simply a great book, generously delivering on the author’s promise of usefulness for beginning and experienced therapists alike. Dr. Nielsen’s approach is practical and smart. The book is compelling and readable. Nielsen carries off the impressive feat of integrating concepts and techniques from various therapeutic schools into a unified and usable language and therapeutic plan of action. For the psychoanalytically oriented therapist, he shows us where our perspective is especially helpful in couple therapy, but also wisely offers a broader set of tools for more effective outcomes for our couple patients." —Prudence Gourguechon, MD, Past President, American Psychoanalytic Association; Faculty, Institute for Psychoanalysis, Chicago, Illinois. "Arthur Nielsen’s book is well written, richly researched, and ingeniously thought out. I know of no better account of the range of alternative approaches that contemporary couple therapists actually use. But what really strikes me are the verbatim interventions sprinkled throughout the book—the kind that make you think, “What a clever way to deal with that particular couple therapy situation. I’ve got to use that in my own work." —Dan Wile, PhD, Assistant Clinical Professor, Clinical Science Program, Department of Psychology, University of California, Berkeley; author of Couples Therapy: A Nontraditional Approach. "Drawing upon his vast theoretical knowledge and many years of clinical experience, in this highly readable volume, Nielsen tackles the many knotty problems that couples therapists encounter, navigating us through the sometimes murky waters by providing in-depth, cross-theoretical conceptual understandings of couples’ problems and offering a multitude of tremendously practical, creative, and useful exercises and tips to help couples solve problems and change the dance." —Rhonda Goldman, PhD, President, The Society for Psychotherapy Integration; Professor, Illinois School of Professional Psychology at Argosy; author (with Leslie Greenberg) of Emotion-Focused Couples Therapy: The Dynamics of Emotion, Love, and Power. "This is a masterful integrative guide to couple therapy. Art Nielsen brings into dialogue psychodynamic, systems, and behavioral approaches, helping the therapist think broadly and deeply. His clinical examples are terrific, his orientation—informed by research and best practices from multiple theories—humane and empowering. A tour de force!" —Mona D. Fishbane, PhD, Director, Couple Therapy Training, Chicago Center for Family Health; author of Loving with the Brain in Mind: Neurobiology and Couple Therapy. "Even as some portions of our profession succumb to the “marketplace” strategy of giving their approach a brand label, exaggerating its differences from competing brands, and testing it against an intentionally lame comparison group to get it on spurious lists of “empirically supported” therapy brands, others, like Arthur Nielsen, aim to improve our service to those we work with in less self-serving and more open-minded fashion. His genuinely integrative approach is to be commended, as is his careful consideration of how each perspective can contribute to the larger effort to help couples change." —Paul Wachtel, PhD, Founder and Past President, The Society for Psychotherapy Integration; Distinguished Professor in the doctoral program in clinical psychology, City College of NY and CUNY Graduate Center; author of Cyclical Psychodynamics and the Contextual Self.